Care Wear is a national information source connecting volunteers who are looking for opportunities to sew to serve babies with hospitals and organizations that need handmade items for premature and hospitalized infants. Volunteers who can sew, knit or crochet are invited to join the effort. 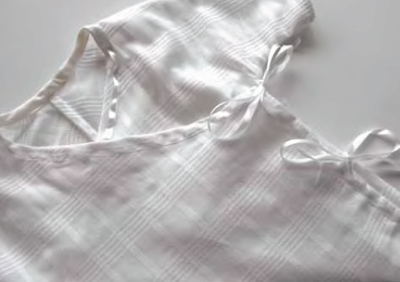 This Baby Kimono Wrap Tutorial from Sew Mama Sew is perfect for donating to babies in need! Handmade items to sew can include everything from simple quilts, blankets and stuffed animals to clothing items. Check out the extensive list of sewing items for ideas of what you can stitch to volunteer at the Care Wear Sewing page. Find organizations that have a specific need for items at the Care Wear home page, or search for a hospital in your area to donate items to at the Hospitals page. While the focus of Care Wear began by serving premature babies, the organization has expanded to include larger infants, children, and even geriatric patients. A note at the Care Wear website mentions that most hospitals will always welcome small blankets and quilts for babies sized about 30″ x 30″. A quick tip for donating to a hospital in your area; make a quick call to the Volunteer Services representative and ask directly what handmade items are needed most. In that way you can be assured that your handmade items are in need and will be put to good use.